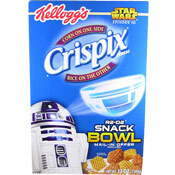 Which cereal is "big... yeah, yeah, yeah... it's not small... no, no, no"? While the name "Cubs" was registered in 1938, it wasn't until 1957 that a cereal named Cubs was produced. 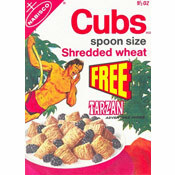 Cubs (which means "small bears") was comprised of small or cub-sized shredded wheat biscuits. What do you think of Cubs? Remembered from my schooldays (now 74). Think they were smaller version of Shreddies but more of a brown color and a sweeter (malted?) flavor. Loved 'em - bring them back please. I found a newspaper ad for this cereal in a 1938 newspaper. This probably has been a Canadian product. Although it was not to be confused with the Chicago Baseball team. According to the book American Slogans (1949), there were ads for Cubs cereal already produced. So it definitely came out well before 1957.